Research and lessons learned from a collaboration between the CGIAR Research Programs on Roots, Tubers and Bananas (RTB), and Policies, Institutions and Markets (PIM) to produce gender-sensitive tools to make value chain interventions more gender responsive have been shared during a training workshop for CGIAR gender research experts. 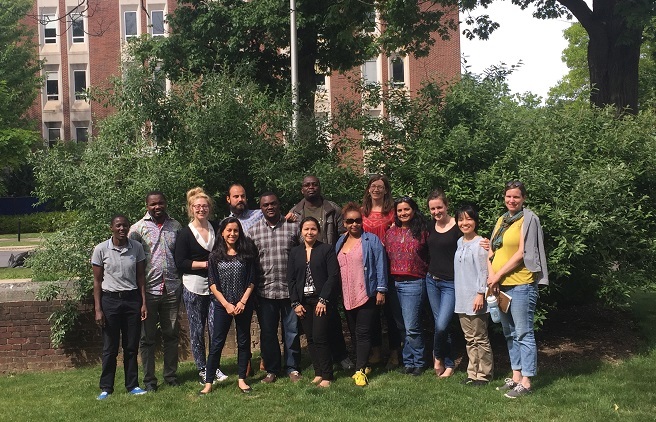 Hosted by Pennsylvania State University, the three-week Gender Research & Integrated Training Workshop (7 – 24 June, 2016) is part of a series of initiatives by the CGIAR Gender and Agriculture Research Network in partnership with Penn State to enhance the quality of CGIAR gender research. The workshop focused on topics including the historical context of gender and agriculture science, connecting social theories to agricultural research and designing high-quality research plans. “The purpose of this workshop is prepare the new generation of CGIAR gender research leaders, improving skills to produce high quality research across centers and CGIAR Research Programs. Being part of this team is an honor and a great learning experience, but also a great responsibility since we are called to ensure the gender research in our centers,” explained Cecilia Turin, a postdoctoral researcher with the International Potato Center (CIP) working on climate change adaptation and gender, who attended the workshop. Cecilia’s gender research focuses on understanding the impact of agricultural innovations in household decision making and labor allocation and gendered knowledge systems. As part of the program Andre Devaux, Regional Director for LAC and Strategic Leader at CIP, presented the experiences of the RTB and PIM research team in developing a guide for integrating gender into participatory market chain approaches, focusing on the case of Papa Andina with the IssAndes project in Peru. The guide, entitled ‘Technology for Men and Women: Recommendations to reinforce gender mainstreaming in agricultural technology innovation processes for food security’, was recommended as one of the key reading materials during the course. Co-financed by RTB and PIM, the guide provides recommendations for designing and implementing technology diffusion initiatives with a gender perspective in order to help development practitioners design and disseminate agricultural technologies that will be adopted by and benefit both men and women. “I became proud of being a gender researcher at CGIAR, which was the most valuable aspect of this course,” said Nozomi Kawaruzaka, a postdoctoral fellow with RTB who is working on various collaborative projects with CIP and the International Center for Tropical Agriculture (CIAT). Nozomi’s work focuses on understanding gender relations and gendered agency, gendered processes of agricultural innovation and the social dimensions of food insecurity and under-nutrition. “Leland Glenna’s lecture on philosophies and Processes of Science inspired me. The concepts and beliefs we discuss in his class, such as technological determinism, scientism, category errors, neoliberalism, ecological fallacy and hierarchy of needs, helped me to recognize how far I am from a vast majority of scientists at CGIAR,” she explained. Workshop participants gather at the end of the first week of the GRIT Workshop at Penn State, USA. Photo: CGIAR Gender and Agriculture Research Network. “At the same time, I came to believe that qualitative social science research can challenge those dominant thoughts and thereby contribute to transforming agricultural research for social equality,” added Nozomi, who along with her cohort of accepted participants from varied CGIAR Centers and Research Programs will return for a further training workshop at Penn State in 2017. Participants were also paired with a mentor for the duration of the training, until 2017. “We learned from Jacqui Ashby (leader of the CGIAR Gender Network) the importance of mentorship at this stage of our careers. Professor Carolyn Sachs, coordinator of this training program and leader of Gender Studies in Penn State is my mentor, and it is a privilege connecting with a mentor of such wingspan,” said Cecilia. “We also learned the need to incorporate gender and feminist approaches to improve gender research quality. Professor Sachs said she cannot think of gender research without the connection to gender and feminist theory. Mentorship on gender also ensures the connection with the gender and feminist approaches, frameworks that enlighten the gender research and analysis,” she added. The training was preceded by the inaugural Gender, Agriculture and Environment Initiative (GAEI) Symposium also at Penn State, which brought together a network of scholars who conduct research and evidence-based outreach on areas including sustainable agriculture, gender and climate change, gender and value chains, and gender-integrated research methods. Both events not only provided capacity building for the scientists, but also an opportunity for CGIAR postdoctoral researchers to get to know each other and create an internal network of support and partnership, allowing for more opportunities for mentorship and collaboration. Learn more about Penn State University’s partnership with the CGIAR Gender and Agriculture Research Network. This entry was posted in News, News & Events and tagged gender, partnerships, workshop on Jul 22, 2016 by RTB.